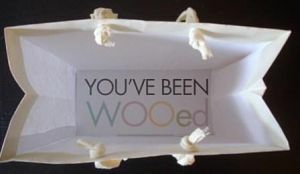 I bought a pair of shoes at Shoe Woo and got a marketing message AFTER I got home. I’m often asked for charity auction gift bag ideas and here are some thoughts rooted in examples from the for-profit sector. This is a clever corporate marketing technique that can be adapted to your charity auction to ensure your gala leaves a warm, lasting impression in the minds of your auction guests. To set this up, here are two stories. Story #1: The unexpected message in a bag. I didn’t expect that at the bottom of the bag. Clever. Story #2: A slip of paper left in the pocket. While attending a sales-related conference last year, I heard Suzanne Falter-Barnes speak. She told a story about buying a jacket from an outdoor apparel company. Wow, a goddess. That has a nice ring to it. Key point #1: Both of these ideas were inexpensive. Shoe Woo has to print bags anyway. The outdoor apparel company has to package those coats for shipping anyway. Adding a message to the bag, or slipping in a piece of paper in the pocket, are minor tasks that leave a cool impression. Key point #2: It was a surprise. Instead of giving guests your auction gift bag in a predictable way at the end of the night, what if the contents of that gift bag were delivered in a different way? Although I am not a big fan of gift bags per se, I do understand why some groups have them. As I think about my some of my recent events which gave gift bags to guests, each gala was held in a hotel which required guests to valet their vehicle. Guests at a Four Seasons gala received a gift bag with make-up and coupons. Guests at the Ritz Carlton gala received a farmer-type cap. Guests at the Intercontinental Hotel received a holiday tree ornament. To carry this corporate marketing concept through to your gala, why not put the gift bag in the car? The valet has the responsibility of leaving the gift bag in the car, one per vehicle. That’s easy. Although I’ve not seen this idea used at a benefit auction, I personally have been the recipient of the tactic. A few years ago when I was still working in corporate marketing, I attended the opening of Fairmont’s Gold level in Washington, D.C. At the end of the night, the valet brought me my car. As I was driving away, I noticed the valet had left a lovely wine opener complete with a bow sitting in my cup holder. I was so excited to get home because I wanted to take a closer look! The experience of the evening lingered with me beyond me leaving the party. What can you do to ensure your event lingers in your guest’s minds? What a great idea! special little gifts to help your event “linger” in your guest’s mind. Sherry, you’re so full of original and such cool ideas! thanks! Your post has challenged me to keep thinking up small but memorable ways that organizations can bring a smile to the face of their supporters. Thanks for this.